PITTSBURGH, JUNE, 25 2018 — A 62-year-old pediatric nurse practitioner used her body to shield a woman from an armed assailant; a 49-year-old sheriff’s deputy advanced into a burning home despite an explosion and other threats to carry a bedridden, 82-year-old woman to safety; a 47-year-old construction worker fought off attacking dogs that had latched onto the head of a 17-month-old boy and pulled him from his stroller. These are a few of the extraordinary acts of civilian heroism recognized in the latest class of Carnegie Heroes awarded by the Carnegie Hero Fund Commission. Whether plunging into frigid waters to save a person from drowning or entering extreme environments of heat to rescue an individual from burning, these heroes exhibited persistence, glory, friendship, and strength by risking their lives in pursuit of saving another’s. Nineteen individuals will be honored and awarded the Carnegie Medal for their acts of bravery and heroism. The Carnegie Medal is given throughout the United States and Canada to those who risk their lives to an extraordinary degree while saving or attempting to save the lives of others. The heroes announced today are the second group of awards made in 2018 and bring to 10,028 the total number since the Pittsburgh-based Fund’s inception in 1904. Commission Chair Mark Laskow said each of the awardees or their survivors will also receive a financial grant. Throughout the 114 years since the Fund was established by industrialist-philanthropist Andrew Carnegie, $40.1 million has been given in one-time grants, scholarship aid, death benefits, and continuing assistance. Brian R. Gadwell Allen Park, Mich.
Steven A. Rauser Ann Arbor, Mich.
David Moen Lake Orion, Mich.
Stephanie L. Pelley St. John’s, N.F. Charley Torres St. John’s N.F. Joshua Aaron Traylor,deceased Clinton Township, Mich.
Ron Allen Elko Clinton Township, Mich.
David Scot Love Flat Rock, N.C.
James Williams Green Bay, Wis.
Scott Derrick Whitford,deceased New Bern, N.C.
Kristian F. Falkenstein Newtown, Pa.
Deanne M. Kilian Olathe, Kan.
Richard R. Krul Grand Blanc, Mich.
Connor N. Devine Warwick, R.I.
Michael E. Surrell, Sr. Allentown, Pa.
M. Ross Klun Somerville, Mass. Resumes of the acts follow. 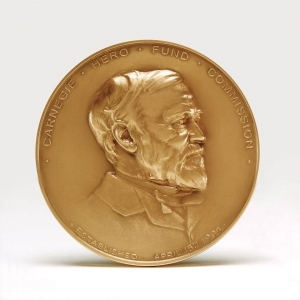 To nominate someone for the Carnegie Medal, complete a nomination form online, write the Carnegie Hero Fund Commission at 436 Seventh Ave., Suite 1101, Pittsburgh, PA 15219, or call 1-800-447-8900 (toll-free). More information on the Carnegie Medal and the history of the Carnegie Hero Fund Commission can be found at carnegiehero.org. Find us on Facebook and Twitter.